A complete landscaping service covering the East Devon area. The Catering committee under the superb leadership of Hazel Hallett caters for events within the village and for groups visiting the area. Being just 4 miles from Sidmouth, Sidbury makes a good refreshment stop for visitors to the Jurassic Coast, The Donkey Sanctuary, Sand House, Bicton Gardens and Sidmouth itself. Within our village, St. Giles Church has a Saxon Crypt and there are many footpaths. 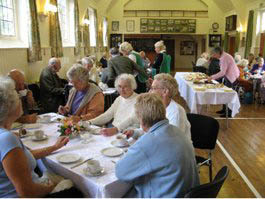 We can provide morning coffee, lunches, cream teas, hot and cold suppers. During the past year we have catered for a Christening, a wedding and, sadly, for a number of funerals. Sidbury W.I. is famous for its special secret recipe Sidbury Loaf. Many of these are to be found on our stall on Sidbury Fair day.